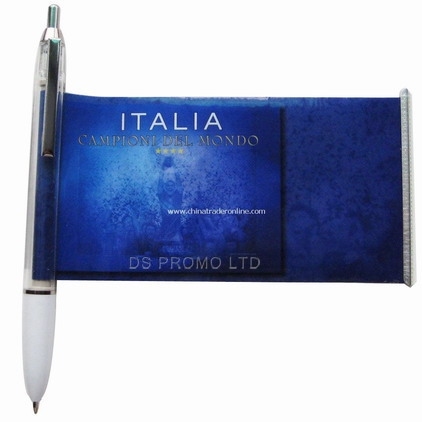 With large advertising area; Direct manufacturing, and direct shipment; Low cost flyer pens to promote your business. 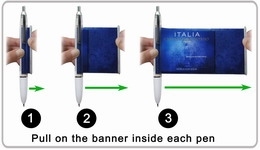 DSP-B005 is a kind noble style flyer pen, with outstanding body and big banner inside. Large place enough for you to advertise on it, and any colorful logo or images can be printed on the banner. The flyer pen can bring about something more to you: it can be a fun toy. You can scroll it out and scroll it back, never feeling boring. Step 2 – We will make the artwork based on your design or what you think, including model, color, style and layout of flyer pen, and then send the designs to you for approval. Step 4 – When the goods are ready, we will use express or other forwarder to deliver the flyer pens to you.